Finely chop the shallot and garlic and pour into a pan with a tablespoon of olive oiland let dry for 3 minutes. Add finely minced fish flesh and shrimp. Mix the ingredients well for a few minutes. United thawed and squeezed spinach and cook for another 2 / 3 minutes. Let cool then built a whole egg, salt and pepper. Roll out the dough on a pastry board well floured, dividing it into strips of 4 cm,recline the mounds of filling to 4 cm away from each other. Brush with water, one side of a strip of the same size and side wet, place it over the one on which you put the filling. 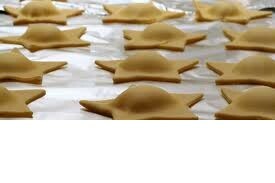 Squeeze the ends to make the dough and join a star-shaped cutter cut the ravioli. Chop the other half of the scallions, parsley and pour in a pan with a little oil and cook for 3 minutes. Soak half a cup of water, salt and continue cooking for 15 minutes. When cooked, add the pepper and pour a little olive oil, if liked. Boil the stars in salted water, drain and immediately season them at the right timewith the hot sauce.